Are you known as the Cucpake King or Cupcake Queen amongst your friends? If you answered YES to at least two of these questions then this page is specially written to answer all your questions. I am often asked how to sell cupcakes and how to start a cupcake business. My first suggestion would be to make cupcakes for family and friends at every possible opportunity. Wherever you go, take cupcakes. It won't take long before your friends and family will start asking you to make cupcakes for them. Then their friends will ask and so on and so on. It may take a while to build up orders but you can have lots of fun trying new recipes and deciding the easiest way for you to frost the cupcakes. Choose recipes that are fool-proof and always please your customers. In the beginning it is probably best to concentrate on two or three favorite recipes that you know are crowd-pleasers. I love my Chocolate Obsession recipe as it keeps really well. This is important if you have to bake an order a day before it is due so that you have plenty of time to frost without the cupcakes going stale. You can put up notices at local shopping malls advertising your cupcakes. Going to local swap meets, car boot sales or taking a stall at a fete are other ways to advertise and start selling cupcakes. Print up some flyers and do a letterbox delivery in your local area. These are all relatively cheap ways to get started but they also bring good results. I know you don't want to give away your profits but make mini cupcakes and give them away at local shopping areas. Attach a small flyer or business card to each cupcake that contains all your contact details. Give cupcakes away at local charity events so that your name can be listed amongst the sponsors. Nobody knocks back free cupcakes!! 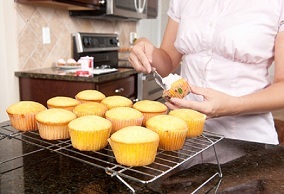 A cupcake business can be started with very limited funds if you are able to work from home. If you price your cupcakes properly you should see profits very quickly. Don't try to undercut your competitors with your pricing. Even if you are working from home make sure that you include all your overheads. You have to think big and realise that if this business venture takes off and you need staff or bigger premises (or both) you can't double prices overnight to take extra costs into consideration. Is it a hobby or full-time business? You need to decide if you want to sell cupcakes as a hobby or past-time or whether you can see yourself making cupcakes 6 or 7 days a week. Do you want this to be a full-time occupation and can you make arrangements if you are sick or need holidays? Note: The ability to work from home is dependent on local laws as some countries do not allow goods to be sold commercially from a home kitchen so you will have to research your local by-laws. If you are unable to bake from home and need to operate from a commercial kitchen your cost of production immediately skyrockets!! This is not, however, an insurmountable problem. Just look around at all the cupcake bakeries that are succeeding and know that you too can be successful. There are lots of great resources available if you are interested in starting your own cupcake business. Because I have been asked so many times about the best way to start a business I have prepared an ebook which will help you from the beginning stages of thinking about starting your own business through to checklists for completing orders on time. And don't forget to come back and let us know how your business is going. We would love to hear from you. Have you started your own Cupcake Business? 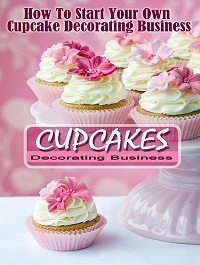 Have you started your own cupcake business and have some great tips or suggestions for other readers? Do you bake from home or from a commercial kitchen and have some great selling techniques to share with us? Do you work for yourself or have you joined a franchise?